We make audio applications and hardware controllers. RUNXT is a subdivision of FIRMA 103. Your e-mail address will be used for RUNXT mailings only. Playgrit is the New Shuffle! Want a shuffled playlist but still in need of some control? Maybe start with a little Rock and end with some Christian Rap? PlayGrit is a grid representing songs in your iTunes library. 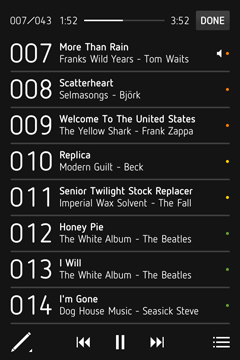 All songs are represented by a single colored dot. The color represents the sorting entity. By default the grid is sorted by genre, so each color represents a different genre. On this grid you can draw a line connecting the dots and thus creating an ordered list of songs or playlist.